Darren Chester is with Heather Costigan (centre), Sandra Huggins (right, rear) and Maree Geddes (right, front) of the Friends of the Nowa Nowa Community Gardens. Community volunteers behind a project to rejuvenate a memorial to the only soldier from Nowa Nowa to die during World War Two have been congratulated for their vision and hard work. The Federal Member for Gippsland Darren Chester, who is also the Minister for Veterans’ Affairs, recently visited the memorial and met some of the volunteers driving the project. Mr Chester announced late last year the Federal Government would contribute $3600 to the construction of the memorial in Hall Road. A feature of the memorial is a sculpture of a kneeling soldier that honours the memory of a local serviceman who died during the Second World War. “More than 70 years ago, the Nowa Nowa community planted a Western Australian flowering gum tree in memory of Henry Ernest Whitbourne, known as Ernie. He was one of 20 residents of Nowa Nowa who enlisted to serve during the Second World War. He drowned near Crete in May 1941 and was the only local not to return home,” Mr Chester said. The original flowering gum has since died and the stump has been carved by sculptor John Brady to become part of a new memorial to Ernie. 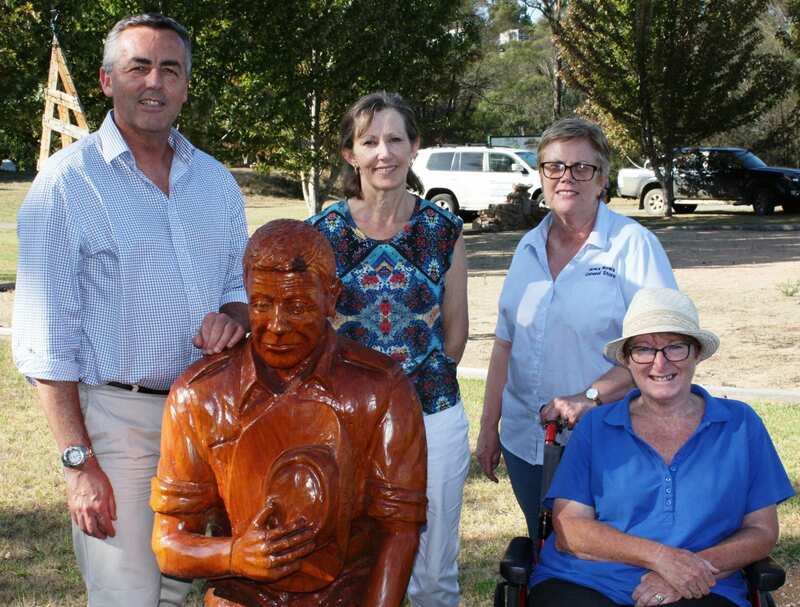 Mr Chester, pictured with Heather Costigan (centre), Sandra Huggins (right, rear) and Maree Geddes (right, front) of the Friends of the Nowa Nowa Community Gardens, said the wider memorial area was a moving tribute to the service and sacrifice of servicemen and servicewomen from Nowa Nowa and the surrounding districts. “Everyone involved with this project should be congratulated, particularly for their thoughtful approach to preserving Ernie’s memory and knowledge of his story,” Mr Chester said. Nowa Nowa is one of 55 communities around Australia to share more than $130,000 under the Saluting Their Service grant program, which provides funding for projects that commemorate Australia’s wartime history and reflect our gratitude to those who served.